Jay Dratler in a photo from the jacket of his novel “The Pitfall,” listed on EBay at $245. Jay Dratler, a well-educated and cultured writer from the east who had done postgraduate work at the Sorbonne before writing some novels, was selected to do the adaptation and screenplay of “Laura” because of his sophisticated and urbane background. He had been in Hollywood only about three years, working as a free-lance writer on a few undistinguished B films and routine program pictures (“La Conga Nights,” “Meet Boston Blackie,” “Fly by Night”). Behlmer was writing in 1982, long before the conscientious researcher had access to the online archives of newspapers and magazines, which may be why his research is less than perfect. Whatever the reason, Dratler deserves a better accounting of his career. A June 2, 1938, ad in the Film Daily lists Jay Dratler as an MGM writer in distinguished company. His contract apparently expired after a year, because in November 1938, Dratler and Aleen Wetstein sold an original titled “Youth in America” to Universal. (Motion Picture Herald). Dratler also wrote the script — with Harry Clork and Paul Gerard Smith — for the 1940 Universal comedy “La Conga Nights,” a curious film in which Hugh Herbert played six roles, five of them in drag as his mother and four sisters. Also in 1940, he sold the original stories “Siege of Alcazar” and “Mystery Swingsters” to Universal, and he sold the story “Angel Cake” (with A. Dorian Otvos) to Columbia. He also drew less than glowing reviews for the Columbia picture “Girls Under 21” (Film Daily called it “a drab picture of slum life”) and was mentioned in reviews of the Universal picture “Where Did You Get That Girl?” which was part of a series of films based on modern interpretations of old songs. 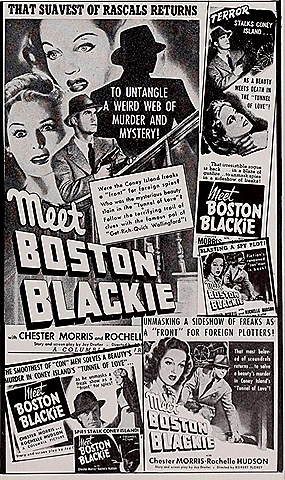 What helped put Dratler on the map was the 1941 Columbia picture “Meet Boston Blackie” (followed by “Confessions of Boston Blackie”), which launched a series of 14 films through the 1940s starring Chester Morris as the debonair jewel thief, matching wits with Richard Lane as the intrepid Inspector Faraday. “Meet Boston Blackie” in Film Bulletin. Dratler closed 1941 with a deal with Columbia for an adaptation of “Highly Irregular,” with Gina Kaus, who wrote the original story. Kaus and Dratler sold another story to Columbia, “Knights Without Armor,” a story about Yugoslav guerrilla warfare. In April 1942, “Highly Irregular,” with Franchot Tone and Joan Bennett, was released by Columbia as “The Wife Takes a Flyer.” In an America battered by Pearl Harbor and struggling to respond in the early days of World War II, the film was called a “riotous comedy kidding the Nazis sick, should provoke terrific box office invasion,” according to Film Daily. In another project with Kaus, Dratler sold the original story “Next of Kin” to MGM in August 1942. He also got a writing assignment on “The Grand Street Boys” and sold the original “Never Been Liked” to Universal. Dratler began 1943 with passable reviews for Universal’s “It Comes Up Love” with Gloria Jean and Donald O’Connor. “Unusually good little comedy should go over solidly with family audiences,” Film Daily said. And in March 1943, he began work on the RKO picture “Higher and Higher,” which was to be Frank Sinatra’s film debut. This entry was posted in 1937, 1938, 1940, 1941, 1942, 1943, 1944, Film, Hollywood, World War II and tagged 1944, film, hollywood, Jay Dratler, Laura. Bookmark the permalink. I cannot tell you how much this detailed investigation of Laura has enhanced my enjoyment of the film. For delving into mysteries both fiction and nonfiction, I thank you very much. The number of important American writers on the MGM 1937 Writers List is nothing but amazing. It reminds us of the role of the Hollywood studio system in keeping writers well fed and watered during the Depression. It is a most impressive array of talent… I was pleased to stumble across it.